You’ll definitely want a quality hose end sprayer if you’re going to be applying liquid organic fertilizers and inoculants. This is the metal trigger Hudson hose end sprayer, probably the best hose end sprayer on the market for home gardeners as long as your garden isn’t too big. I used to carry the Gilmour hose end sprayer 362, but Gilmour has now stopped making hose end sprayers. Luckily, I found this Hudson sprayer that as far as I can tell is exactly the same as the Gilmour – perhaps even made by the same manufacturer, but I’m not sure about that. This is a professional hose end sprayer. It’s very sturdy, made with brass fittings, a comfy metal handle and a quality 1/2 quart plastic container, so it will last a long time. If you have enough water pressure, this hose end sprayer does a great job reaching up into trees and out into the middle of your garden. The dial is physically a bit difficult to turn, so you’ll need a strong hand, but it does produce an accurate dilution ratio. My goal is to spray both the top and bottom of the leaves of my plants with spray that isn’t too coarse and isn’t too fine. Too fine and I know I’d be harming some beneficial microbes in the spray. Too coarse and the spray doesn’t stick as well to the leaves. This sprayer creates the right water drop size. If you’re combining products that all have different dilution rates, just use the highest dilution rate. For example, if you’re combining EM (1:250 dilution) with seaweed (1:50) and molasses, make sure you get your 1:250 ratio for your EM (which is to set the sprayer dial to 1 Tbsp) and the others will be fine even if they’re more diluted, i.e. it’s always okay to dilute more with water, just not less. So if I was going to spray a 1000 square foot garden, I’d add 1/2 cup of seaweed, 1/2 cup of sugar or molasses and 1/2 cup EM, then set the dial to 1 (a 1:250 dilution) and spray the whole thing. Actually, I’d dissolve the sugar or molasses in 1/2 cup of warm water first and add that to the bottle. That changes my dilution rate, which means I can set my dial to 2, which means the sprayer will have better luck pulling up the solution. I often fill the container up with water, especially if I’m spraying a solution with molasses or fish, as they’re a bit thicker and the sprayers can sometimes have a bit of difficulty sucking them up, especially if water pressure is low. The one downside of the sprayer is that the bottle is a little bit small. If it were bigger, I’d use 1 cup of liquid fish in there, too. That’s the one thing – if you have a big garden, you may need to fill the sprayer up a couple of times in order to get everything covered. If you’re using these sprayers to apply mycorrhizal fungi powder, dissolve the fungi in some warm (not too hot) water first and then fill up the sprayer with that. The last part is cleaning. With any sprayer, always clean it right after use. It just takes a minute. I rinse out the container, fill it with water and then spray some of that water to get all of the gunk out of the internal parts. Do that and these things will last a lot longer! In summary, this Hudson sprayer is a high-quality sprayer, with the only downside being that the dial is a bit hard to turn, but I believe it’s the best hose and sprayer for organic gardeners – let’s start spraying! Okay, I have liquified seaweed and also BioAg probiotic additive that I want to spray in my planting beds. Recommended application rate for the seaweed is 2 Tbs per gallon. Recommended application rate for the BioAg is 1 Tbs per gallon. My plan is to put those amounts into my Gilmour 362, set it to 1 Tbs per gallon and spray until the mixture is all gone. Is that a good plan? Almost. But what I would do is try to figure out the square footage of the area you’re spraying first. Then, per 1000 square feet of area, add 1/2 cup of BioAg to the container and whatever amount of seaweed is appropriate, then set it to 1 Tbsp per gallon and spray that over the entire area – that way you’re getting proper quantity and proper dilution. I know there’s a bit of math involved to figure out square footage, but once you’ve done that, you’ve got it. It gets a little more tricky if the product label doesn’t tell you how much to apply per area (for example, 2 Tbsp per gallon is helpful for dilution, but I also like to know how much per 1000 square feet), but for your seaweed, odds are that 1/2 cup is also appropriate. If you need help figuring out square footage, send me some photos and I’ll do my best to help. I would LOVE your help! Problem is we don’t have a single planting bed that is square or rectangular. There are curves, half circles, circles, comma-shaped beds with rocks and gravel in between (with weed-block under the gravel) and a concrete sidewalk running through the middle. That’s just the front yard. The back yard is even more fun with decayed granite paths (with weed-block under) and grassy areas, some trees and scattered planting beds. The weed-block does let moisture through, so should I be spraying the gravel as well then? If so, figuring the square feet will be a LOT easier! Just measure the width and length and multiply. Not counting the pathways, I doubt that we have 1,000 square feet to spray, but I could be wrong. A fast way to estimate is to figure out the full square footage and then estimate what percentage of that is taken up by paths and then subtract. If the full yard is 40 feet * 40 feet, that’s 1600 square feet. If the sidewalks take up about 1/3 of that space, the garden area is about 1000 square feet.You certainly can spray the gravel. How much molasses would you add to this mixture? You think this formula should be applied once a month during the growing season? Apply the same amount of molasses as EM. Yes, I apply monthly. I have a Chapin 6004 wet hose end sprayer and use the Neptune’s Harvest seaweed fertilizer with it. I constantly have clogging issues. Will the Gilmour hose end sprayer 362 alleviate this problem or is there something else I should do? Thanks for your help! I’ve owned that Chapin as well. One trick is to mix your seaweed with equal parts water to help it get through better. This spring I plan to do some more side by side testing with Neptune’s stuff to see which of my sprayers does the best with it, but I didn’t have problems with the 362 last year, so I recommend you try it, and if it doesn’t work, let me know and I’ll be happy to refund you. Thanks, Phil. I’ll give it a whirl. So did you mix your seaweed with equal parts water when you used it in the 362? And do you need to account for this dilution when calculating the proper amount to use? Sorry for the late reply – I’ve been away. I mix my seaweed with other products that tend to have the consistency of water, such as EM, so probably that helped. As for accounting for the dilution, yes in theory you would do so. I actually don’t mind a more diluted application rate, so I don’t worry about that much, but since mixing with equal parts water would effectively double the dilution rate, you could double the rate on the dial (e.g. go from 5 Tbsp per gallon to 10). Phil, can you recommend a water filters to remove impurities, or should I be concerned about this? It’s worthwhile getting a filter for your hose. I can’t recommend a specific one at this point, but I’ll be looking more into that soon. Plan to spray my lawn with Talstar insecticide and the manufacturer recommends 1 oz per 1000 sq ft. I have 2000 sq ft to cover. If I put 2 oz of Talstar in the container… what should the dial be set at? Should I worry about using city water from the garden hose. Won’t the Chlorine and other chemicals in the water harm the bacteria, mulch, and fungi in the soil? It’s not ideal, but not the end of the world. Some chlorine will dissipate in the air, some will be broken down my microbes, some is actually used by plants as a nutrient, and some may harm some microbes. You can buy a chlorine filter for the hose, but you need to make sure it won’t decrease the water flow rate too much. Within your link to Best Hose End Sprayer you have a link to sprayer instructions. When I click on the link I get a 404 error. Thanks for letting me know, Pat. I can’t find the new instruction page. I’ve emailed the manufacturer, but no response so far. Does this spayer work well with small quantities? I have a 200 square foot garden, so I am often using just a few tablespoons. My Ortho sprayer does not consistently draw from these small amounts. Would the Hudson sprayer work better? I don’t think the Hudson will be much different. With any sprayer, when I’m using small quantities, I just put some water in there to compensate. 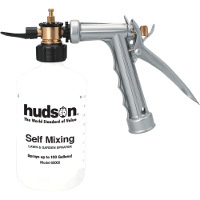 I purchased the hudson self mixing garden sprayer but it doesn’t seem to mix the ingredients. I put all the ingredients into the spray bottle (150 ml) total. I attached sprayer to hose & began to spray my plants. I did not visually see the ingredients being mixed nor, after 30 min of spraying did the 150 ml reduce in amount. I have a lot of water pressure. I’ve checked the sprayer for any debris or washer failure, but seems fine. Any suggestions? I don’t think “self mixing” means that it mixes the ingredients but rather that it mixes the ingredients with water from the hose so you don’t need a standalone sprayer. In terms of mixing the ingredients, I always just shake really well. If the sprayer is having trouble sucking up the ingredients, it may be because you have something thick in there such as molasses, which benefits from being dissolved in warm water first. Regardless, sometimes you just need to decrease the dilution a little bit, such as by turning the dial from 1 to 3, 4, or 5 (whatever you need to get it to come through). Sometimes I turn the dial to 10 just to get it started and then I can decrease it back down to 1 or 2 or 3 once it’s sucking up nicely.